← Should I Spend Donuts on the Returning Peak Inn & Lyla, Baby Gerald, Santa & his House, or the Stable at the Inn ? Ho Ho Ho Holiday Tappers! Bust out the tinsel and be sure to hang those stockings by the chimney with care because Christmas time is in the air! That’s right my friends, Christmas (and snow, lots and lots of snow) has hit our pocket-sized towns! This year EA is trying something different, as I’ve laid out in this post, in that Christmas 2018 consists of multi-events. Basically, the Simpson family will host four stories to be told over the course of December with a new story releasing each week. As we’re taken through each story a series of prizes are released to correspond with the theme of the story. For Week 3, Act 3, we’re following a Heartwarming Love story as told by Marge, and the prizes we unlock all fit into the Christmas Love Story theme. *NOTE: This will be one of those task boxes, like the Pageant Stage, where you have to SCROLL UP to complete it. So make sure you complete ALL tasks with this, not just 1 or 2. Update: Some of you are reporting you have completed all of the tasks and it’s still stuck. If this is you, and you’re sure you’ve completed all the tasks, try storing all 6 of the flaming trees and replacing them. Thanks to Tracey for this tip. What Does it Do? : After the initial quest nothing. Seems like EA forgot to add a permanent task with this one. And that’s it my friends, the details on the third Christmas 2018 week 3 prizes! 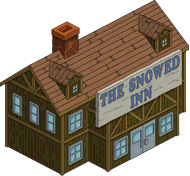 Thoughts on the Snowed Inn? Where have you placed it in your Springfield? Thoughts on Act 3 prizes? How’d you do with Act 2? Sound off in the comments below, you know we love hearing from you! 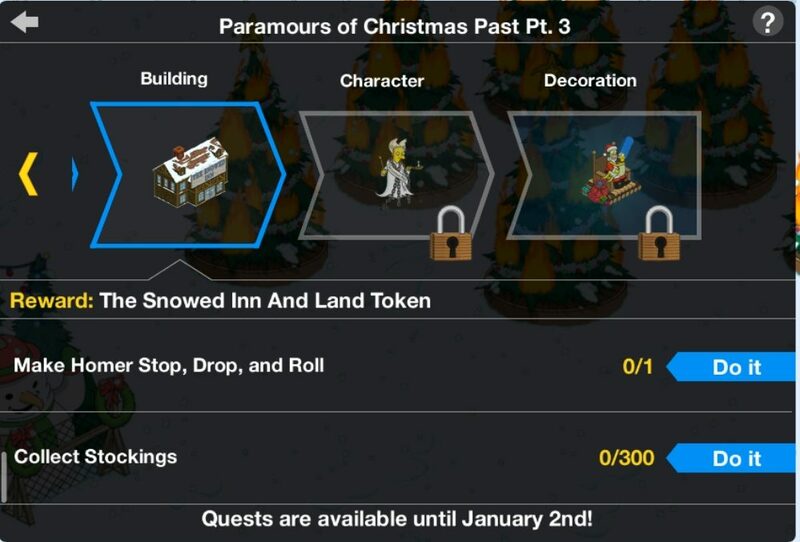 This entry was posted in Decorations and tagged Act 3 prizes Christmas, Christmas 2018 Prizes, How do I get the snowed inn, snowed inn build time, snowed inn size, Tapped Out Christmas Event, Tapped Out Tips and Tricks, task at the snowed inn, The Simpsons Tapped Out, TSTO Addicts, TSTO Christmas 2018, TSTO Simpsons Christmas Special, TSTO Tips and Tricks, what does the snowed inn do. Bookmark the permalink. I’ve tried storing all the trees and re-placing them but it’s still stuck at the Done! screen for the Snowed Inn. Any other suggestions? I’ve been talking to Support and they even reverted the game to no avail. It’s rather frustrating. I got this yesterday and I like the animation of The Snowed Inn, I wonder if the snow animation will still be attached to this after the event. It’s a shame there is no permanent tasks with this building since EA were doing so well with adding tasks to buildings lately but at least some characters like L.T. Smash, Weird Al and Wiseguy can do their “Shops” task at this building. I added this building by the mountains since its the only area it fits in my town. Any body having lagging issues? What’s really strange it doesn’t seem to be the whole town suffering just parts of it. I was afraid already that i was running far behind, but indeed you said you would put up the posts early, so you have some free time during x-mas. Btw i’m off till januari 2nd !!! !